An update to the 2014 report, this version was released by the Sierra Nevada Conservancy on March 1, 2017. 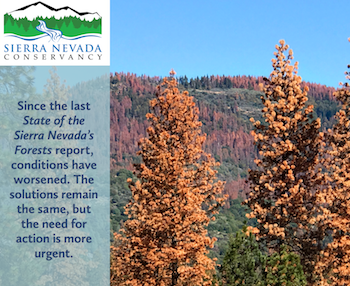 When the first State of the Sierra Nevada’s Forests report was released in 2014, conditions in the Sierra Nevada appeared to be at their worst. The Region had just experienced its largest fire in recorded history, the 2013 Rim Fire, and the trend toward larger, more severe wildfires in Sierra Forests was already clear. Restoration efforts in the Sierra were grossly out of pace with what was needed, and overgrown forests were starting to show signs of stress from only two years of drought. When the 2014 report was released, tree mortality wasn’t even mentioned. What came next poured fuel onto an already raging fire. April 21, 2017 - Wildlife officials and members of the public have seen higher than usual numbers of stranded or dead marine mammals and birds along southern California beaches in recent weeks. The U.S. Fish and Wildlife Service, National Oceanic and Atmospheric Administration, California Department of Fish and Wildlife, and the USGS National Wildlife Health Center are working together to document the size and scope of affected wildlife and mortalities. Stranding reports have included loons, grebes, cormorants, California brown pelicans, and California sea lions. Many loons are currently migrating through the Santa Barbara Channel on their spring migration northward. SPRINGVILLE, CA, April 17, 2017 – Located on 1,100 acres above Springville, SCICON is an outdoor school of science and conservation operated by the Tulare County Office of Education. 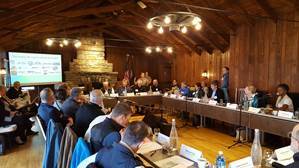 The Sequoia National Forest and SCICON have developed a great partnership over the past couple of years. With the construction of a new office at SCICON by the Tulare County Office of Education, the Forest Service can house a fire engine and staff at the facility, and when times are slow, they help with needed facility maintenance. This winter, several foot bridges were damaged by high water and debris rushing down Bear Creek across the SCICON property. Firefighters were able to clear the debris, secure the bridges, and make needed repairs in time for students to have safe access. PORTLAND, Ore. April 19, 2017. In the Western United States, a small-diameter log and biomass utilization business can help fund active management and restoration efforts and provide rural communities with much-needed jobs. So what should businesses, forest managers, community groups, and others interested in turning the byproducts of forest management into a profitable enterprise consider? A new online handbook published by the U.S. Forest Service’s Pacific Northwest Research Station offers guidance. The publication, Community Biomass Handbook Volume 4: Enterprise Development for Integrated Wood Manufacturing, takes a collaborative approach to enterprise development and recognizes the important role of partnerships and land managers in developing sustainable wood products businesses. The guidance is particularly relevant to communities and businesses near public lands.